Welcome to my little slice of the blogosphere! Most important thing first: the pony! 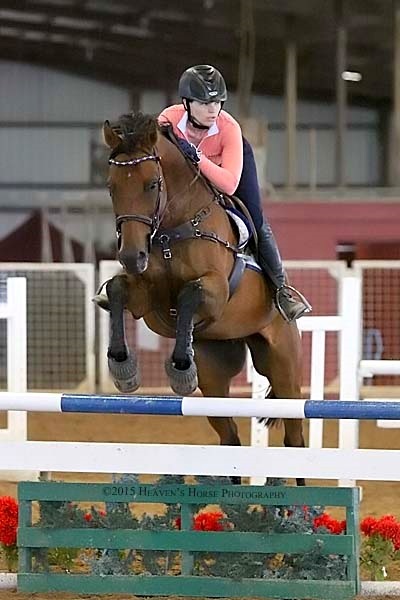 Henry is a 2007 TB gelding that race trained but never made it to the track. In the words of his breeder/original owner “He always cared more about eating than running”. That about sums him up. I bought him in December 2013 for a grand total of $900, via facebook and Paypal (yup, I found him on facebook and paid for him via Paypal. Welcome to the internet age.) sight unseen from a barn in Arkansas. He had shown in the Baby Greens locally once in 2012 but then got shuffled to the back burner due to the owner’s lack of time and had spent the previous 10 months in the pasture. I just happened to show up right in the middle of a liquidation and snag myself a bargain. I bought him based on a 2min video of him w/t/c around the indoor. He looked a little footsore – he was barefoot – and very very fuzzy/fat/out of shape, but there was something about him that I really liked. So I sent her the money, she went and had a coggins pulled, and he got on a trailer to Texas the same day. This is never the way I would advise ANYONE to buy a horse, but ya know… do as I say, not as I do. There’s no doubt that he was fat, fuzzy, needed his feet done and was well on his way to a ranch horse mane, but otherwise – he was adorable! Very accurately represented by the seller – size, disposition, age, etc were all spot on. Whew… major bullet dodged. Over the next couple months he got a makeover, new kicks, and worked a lot on fitness. Everything was like unwrapping a new surprise – oh wow, he jumps cute. Oh wow, he does lead changes. Oh wow, he’s really honest. Oh wow, he has the best personality. Seriously, he was the find of the century. and then switched to eventing in late 2014. 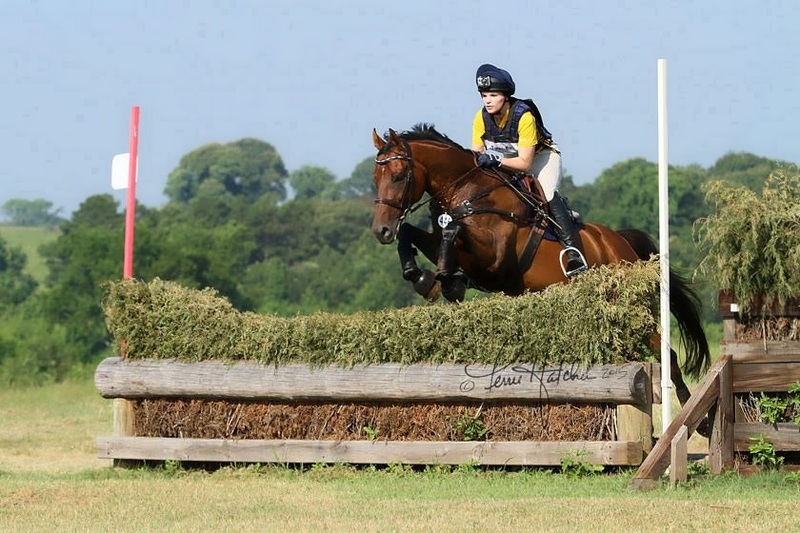 He spent Spring 2015 at Beginner Novice, qualifying for the American Eventing Championships (and finishing 10th individually, 1st place team), moved up to Novice in Summer 2015, and is now preparing for his move-up to Training. This horse is just the coolest guy. He wants nothing more in the world than to eat lots of cookies (which he does, trust me) and please his rider. He’s one of those fabulously good eggs that wants to do whatever it is that YOU want him to do, and his genuine love for cross country is absolutely amazing. After years of owning/riding warmbloods he’s really reminded me of why I fell in love with Thoroughbreds in the first place… they’re all heart. I can’t wait to see what other great adventures we have in store for us in the future! Welcome to the blogging world! 🙂 I got three of my horses in a very similar way, gotta love it, haha! He is such a doll!! You def scored 🙂 And it sounds like he is lucky to have you too! You definitely scored with him!! What a find! I love that you’re riding him in a sidepull. 😀 Also the ribbon over his face picture is so cute! There are a lot of things dedicated to Henry. He may or may not be totally rotten. I love seeing people ‘saving’ cheap racehorses and letting them have a new career in life! Looking forward to following your progress! My first horse (I’ve only had two) was an OTTB and former eventer. I got him when he was 10 and he kept me on my toes for 13 more years. We did hunters and then both of us got old and creaky and switched to dressage. You are so right about the Thoroughbred heart. Today marks one year since I lost him. Even on his last day he was as stoic as all get-out. Probably thinking that this was just one more of those jumps that he knew he would conquer by hook or by crook. Long live TBs! What a GREAT Story!! I am hoping something like this happens for me! I would love own of my own someday soon!!! I love him! We just bought an OTTB in March and he’s the best! Awesome 🙂 I am celebrating my 11th year with my $600 Kijiji Pony (16.3hh 2001 OTTB). We went the opposite direction. Started with eventing, up to training level and now are doing jumpers since we both try really hard at dressage but just arn’t going to be competitive at the next level (and I don’t want the pressure of jumping out of last place! ).